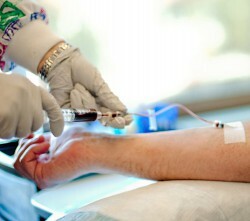 Historically, serum creatinine was analyzed from a blood sample using a method called alkaline picrate. In addition to creatinine molecules, though, it also “counted” non-creatinine molecules that falsely elevated the resulting value by as much as 20%. This assay method was used for decades in the development of creatinine clearance estimates, such as the Cockcroft-Gault method. Within the past 10-15 year, however, laboratories have largely moved to a new assay called IDMS (isotope dilution mass spectrometry). This method does not detect the non-creatinine molecules, which means that the IDMS value is often 10-20% lower than the more conventional assay. Because older equations, like Cockcroft-Gault, were created and validated using a non-IDMS assay, this poses a problem for estimating creatinine clearance (a surrogate for glomerular filtration rate) when using an IDMS-based lab assay. This entry was posted in Clinical Questions, Pharmacokinetics on December 3, 2015 by Sean P. Kane. 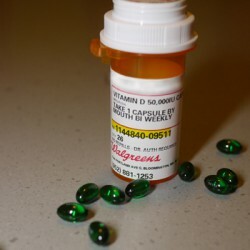 In the United States, vitamin D supplementation is primarily available as vitamin D2 (ergocalciferol) and vitamin D3 (cholecalciferol). Although these two have historically been considered interchangeable and equipotent, the current body of literature strongly supports the preference of Vitamin D3 (cholecalciferol) over D2 (ergocalciferol). Vitamin D3 (cholecalciferol) is produced by the human body in response to sunlight and is also available through dietary sources, such as fish. In contrast, vitamin D2 (ergocalciferol) is not produced in the human body, but is created by exposing certain plant-derived materials to ultraviolet light. This entry was posted in Clinical Questions, Endocrinology, General on July 19, 2015 by Sean P. Kane. What’s the difference between oral and IV magnesium replacement? Magnesium repletion is very common in hospitalized patients. Is there any difference between PO and IV magnesium in patients without symptoms of hypomagnesemia? This entry was posted in Clinical Questions on March 24, 2013 by Sean P. Kane. Should enteral feeds be held when giving oral ciprofloxacin? Ciprofloxacin binds to divalent and trivalent cations (calcium, magnesium, etc). Are there any recommendations regarding giving crushed ciprofloxacin via an enteral feeding tube, such as holding nutrition or increasing the dose? This entry was posted in Clinical Questions, Infectious Disease, Nutrition and tagged cipro, ciprofloxacin, enteral, feeds, tube on November 27, 2012 by Sean P. Kane. What is the best evidence for pharmacologic VTE prophylaxis in trauma patients? Is there a preferred agent for VTE prophylaxis in trauma patients? Is there a superior dosing strategy for these high-risk patients? The selection and dosing of pharmacologic VTE prophylaxis in trauma patients has a troubled, controversial past. The literature surrounding the topic is riddled with small, conflicting trials and methodological flaws. This entry was posted in Clinical Questions, Trauma and tagged enoxaparin, heparin, LDUH, LMWH on November 20, 2012 by Sean P. Kane. How should aspiration pneumonia be treated? How should aspiration pneumonia be treated? Is anaerobic coverage required? The concept of aspiration pneumonia and anaerobic coverage is a complex, controversial topic. Like most controversial topics, there is paucity of evidence, and the literature that does exist is controversial. This entry was posted in Clinical Questions, Infectious Disease and tagged anaerobes, aspiration, pneumonia on October 29, 2012 by Sean P. Kane. Is there a maximum insulin glargine (Lantus) dose? Is there a maximum insulin glargine (Lantus) single-injection dose? Anecdotally, I have heard that patients receiving more than 50 units should split the dose from daily dosing to twice-daily. What’s the evidence? This entry was posted in Clinical Questions, Endocrinology and tagged glargine, insulin, lantus on October 15, 2012 by Sean P. Kane. Kane SP. Clinical Questions. ClinCalc: https://clincalc.com/blog/2012/10/is-there-a-maximum-insulin-glargine-lantus-dose/. Updated June 29, 2016. Accessed April 23, 2019.